I found the word in a dictionary when I was young and fell in love. Etymology: the study of the origin of words and the way in which their meanings have changed throughout history. What could be more interesting in the world of words than tracing back their family tree? If words were people who had taken one of those tests to determine genetic origin, some of these words would be very, very surprised at who their grandparents were. The color auburn is to hair what the color hazel is to eyes: nobody has a hard, fast definition for it. Auburn is indescribable except that it has something to do with red, while hazel could be everything from a funny green, to a funny brown, to a funny grey (shorthand for “we don’t know what to call it” apparently). But the origins of the word auburn? One of my greatest writing weaknesses is the unwillingness to let a character go unnamed while I am writing her/him. It is difficult because I believe they should have a name they deserve-a name that is perfect right down to its etymological roots. It is the tangled family tree of word attributes, origins and connotations that makes me research names for hours and hours….and hours. But, there eventually comes a point where I give up. I throw a name at my character like an old coat and tell them to wear it until I can find them a new one. And it is at this very moment that my beloved etymology dictionary becomes a punch line waiting to happen. It may be weeks or months before I open my dictionary again, possibly out of boredom or perhaps in one more futile attempt to find the right name. But when I do, and I always will, I will look up the rented name I have saddled my character with and my jaw will drop to my knees. 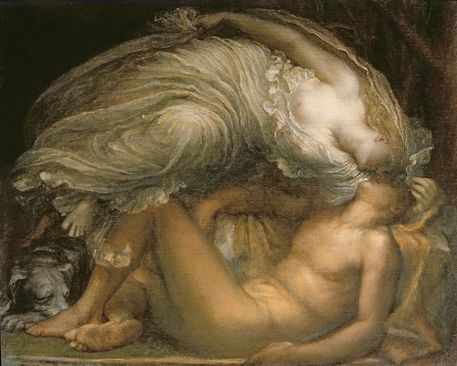 To clarify the connection between the character name and my story, I will provide a brief summation of one version of the tale of Endymion: Selene (Artemis, Cynthia) the moon goddess fell in love with the shepherd Endymion and had his father, Zeus, place him in a state of eternal sleep so that he would always remain beautiful, ageless and deathless, and always within her sight in the cave where he slept. Yep. Turns out my character got the name she deserved and I didn’t even know it. But Inspiration did. The lesson here is the lesson I keep learning over and over: Inspiration is a funny thing and she has her own ideas. Listen to her.